Find here the message the Provisional Commission of the Central Committee of the (new) Italian Communist Party sent to the Symposium on the political order of future socialist countries the Maoist Communist Party of Turkey/North Kurdistan hold in Frankfurt (Germany) on 24 - 25 January. This Symposium faces a very important issue: the political order of future socialist countries. The experience of the first socialist countries (the Soviet Union, the Chinese People’s Republic, and the others) taught many things about the political order the socialist countries need in order to carry out their historical role: the transition of mankind to communism. Leaving aside the labor force, essentially the first socialist countries abolished the private property of the productive forced and of the conditions of production (land, mines, regulation, money, research, formation, etc.). Productive forces were ruled mainly by public authorities. So, in every socialist country the public administration, the State and in general the political structure had a role more important then they ever had in human history. The orientation of political organizations and their composition had become the decisive factor for every transformation, and therefore, in general, for the transition from capitalism (and from the other more backward productive systems and social relations persisting in the first socialist countries) to communism. The political organisms directed all productive units and all country’s institutions (schools, universities, media, research institutes, etc.). More or less effectively (as reality not always followed the established rules and laws) they directed the entire system of social relations. Politics had become the decisive factor of social life. One of the great discoveries of Maoism, one of the five main contributions that Maoism gave to communist thought,  is that in socialist countries the bourgeoisie is mainly constituted by those leaders (of Communist Party, of State, of mass organizations, of firms and institutions) who follow the capitalist road. Still in the last year, undertaking the presidency of Cuba, Raul Castro indicated this (making sure that every adult person carries out the work assigned to him with care, creativity and loyalty) as the main problem of Cuba, and stated that, in order to solve it, it was necessary to return to bourgeois methods. It is what before him did Kruscev, Teng Hsiao-ping and all the other revisionist leaders that begun the decadence of socialism in their respective countries. The latest secretary of the Unified Polish Workers Party (so it was called the communist party in Poland), M. Rakowski, openly declared: every Polish worker has to give up thinking that job, house, heating, clothing, feeding, education, health care and other more things are due to everybody as the air he breaths; he has to learn that they are things that everybody must achieve by hard work. This is a task substantially new in comparison with those that capitalists have faced in bourgeois society. In order to solve it, in everyone of the first socialist countries, in the phase in which they were advancing in the transition from capitalism to communism, different and changeable arrangements of means and organisms were set running. In every socialist country many solutions were tried. In differing ways, coercion and formation were arranged and, in formation, for every individual and group, it was arranged training by a teacher and learning by one’s own direct experience and its balance. Moral incentives and material, economical incentives were arranged in differing ways. In every socialist country this was (and so it had to be by its nature), a process directed by the vanguard promoting the ongoing transformation: the communist party. At the same time it is a task whose most and definitive objective is the emancipation of the masses from the need to be directed by a vanguard as the communist party. That is to say, by a group organized, distinct and different from the rest of the population, constituting itself not by decision of the masses but by decision of its own members. A group which reproduces itself even without the conscious intervention of the masses, which has an its own life that cannot be known, controlled and still less decided by the masses. The result to which socialist society has to tend by its nature is that population constitutes a society that produces its leading organs, correctly knows what they are doing, exercises ongoing and permanent control over them and in every time decides how they are composed, which is their orientation and their destiny. So, it is a very organized society, but without State (intended in it own sense, as organism distinct from the rest of the society and done by people professional in coercion). Who decides the direction the party really follows? The two lines struggle, another one of the five main contributions that Maoism gave to the communist thought. Essentially, there is no other way for deciding it. The bourgeoisie solves the problem to make the individual carry out with care the work assigned to him in a primitive and simplistic way. Rich people are free from work; every rich man works only if he wants and according to his liking. Proletarians are employed for carrying out a work or dismissed by capitalists and other rulers of society: these ones act according to their opinion according to their interests. With this primitive system the bourgeoisie involved mankind in the social process of production, proletarianizing it. But if this system will still last for a long time, it will lead a great part of the 6,5 billions of human beings to extinction. There will be no more place for them. As a matter of fact, for the capitalism that has come to it final phase, the great part of human beings are in excess. The undeclared extermination war the bourgeoisie carries out more and more savagely and intensely these last thirty years against popular masses everywhere in the world, shows it clearly. The final phase of the second general crisis of capitalism, which we enter in the last year, makes see this conclusion of communists also by experience and by sight. Communist thought is not a new divine truth, revealed to men by some prophet, by a new Jesus Christ or by a new Mohamed. It is a science that men built and are building studying experience, trying again and again, correcting their mistakes by criticism and by autocriticism. Communists have also begun to elaborate a science of socialist society. Marxism-Leninism-Maoism includes also what of more advanced Communists elaborated as regards the experience of the first socialist countries. Anyway, much has still to be done. We are doing it, and we have to do it in the ambit of the renewal of the communist movement, that is founded on Marxism-Leninism-Maoism. On the other side there is a combination of mass organizations of many kinds They are the organizations of youth, women, national minorities and of other social sectors targets of particular oppression, victims of double or triple oppression. They are the professional and trade unionist organizations each one of them dealing with an its own aspect of social life, the company and territorial councils, etc. At their head the communist party animates the entire system and it can be at a growing degree expression of this system. The communist party has the direction of the State as well. If the party has a right line, this guarantees that the state exercises a coercive function in the necessary direction (against the reactionary classes, the asocial elements, the aggression from outside) and as much it is indispensable. In the socialist countries the administrative coercion (the political coercion, exercised by the State) has to face also to the tasks that in the bourgeois society are accomplished by economical coercion: in the bourgeois society the proletarian that does not work as the master wants, does not eat, has not a home, has nothing of what is necessary for surviving. On the contrary in the socialist countries every man must have what is necessary for a dignified social life. 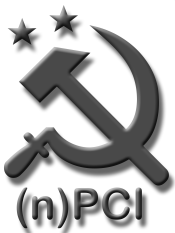 Nicola P., The Eighth Discriminating Factor , (new)Italian Communist party - http://lavoce-npci.samizdat.net.